Transmission lines climb above the hills of Bangui Bay to deliver electricity generated by windmills in Bangui Bay, Ilocos Norte, northern Philippines. Today, sustainable or renewable energy development is the talk of the town given current global circumstances. Global warming and climate change are already threatening our environment and the world is racing to mitigate these problems. This leaves the Association of Southeast Asian Nations (ASEAN) with a development dilemma. It has to contend with the fact that it is a developing region and that means growing energy demand. The challenge then for ASEAN would be to meet this demand and do so in a sustainable manner. To that end, ASEAN has developed many regional instruments. One of them is the ASEAN Plan of Action for Energy Cooperation (APAEC) 2016-2025 which seeks to achieve energy security in a sustainable manner. It covers a variety of areas including cross-border energy connectivity, regional energy policy, renewable energy development and nuclear energy. 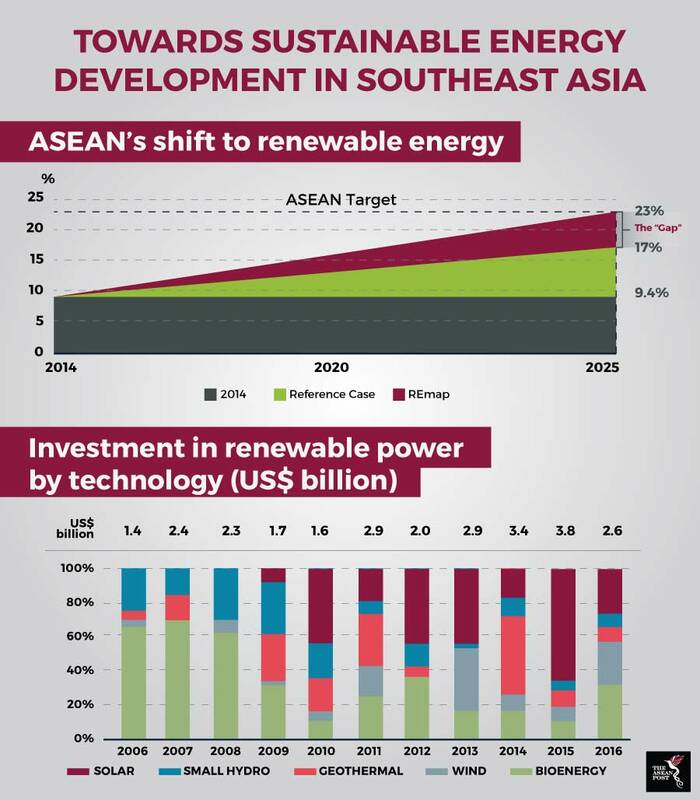 By 2025, ASEAN member states should collectively increase the share of renewables within the region’s energy mix to 23 percent. Putting pen to paper, however, is just the first step. Ensuring proper implementation is where most ASEAN members cough and sputter. One of the stumbling blocks is the costs that come with the shift to renewables. Some renewable projects are expensive to finance but the trick is to identify and leverage on your strengths. Bioenergy potential lies primarily in Indonesia and Malaysia – the world’s largest and second largest palm oil producers, respectively. On the other hand, hydropower is mostly in abundance in the Indochinese region, parts of Borneo in Malaysia and the Philippines. Wind energy holds potential especially in the highlands of Thailand, Vietnam, and the Philippines. Solar (thanks to wide sunlight irradiation in the region) is perhaps the most abundant source of renewable energy in Southeast Asia. Now, comes the tough part of financing such endeavours and the trick here is similar – leverage on your strengths. The pulling factor for countries in this region are the tremendous economic growth rates. Averaging at 5 percent annually, it can go up to 7 percent for countries still in the nascent states of economic development like Cambodia and Lao and even 8 percent in the case of Myanmar. Besides that, countries should actively seek out cooperation with multilateral development banks (MDB) like the World Bank or Asian Development Bank (ADB) and explore fresh debt or equity financing options. The financial instrument of choice for investors in this day and age is green bonds which are similar to regular bonds except that they are used to finance businesses or projects that have positive environmental and climate benefits. Large renewable energy projects which take a longer payback period can enlist the help of MDBs or export credit agencies to make them more bankable. On top of that, insurance companies can be roped in to underwrite the risk involved. As much as one can be an idealist and hope that the shift to renewables will bring about a positive change, that means nothing if the necessary political capital isn’t mobilised to chip away existing policy blockades. The main culprit being energy subsidies. Countries like Brunei and Malaysia allocate large sums of their national budget on subsidising fossil fuels. Especially in Malaysia, the issue of petrol or diesel subsidies is a politically contentious one. Removing such subsidies would be political suicide so the government has always steered fairly clear of doing so. It would be too farfetched to think that Southeast Asia would make the switch to electric vehicles (EV) in the short, or even medium, term. Hence, we are bound to see fossil fuels powering the transportation sector in the coming years until advances in, perhaps, bioethanol or solar powered EVs meet our standards for practical transportation. One area where change can be affected, however, is in electricity generation. The region has to wean off its dependence on coal and natural gas and this means the removal of subsidies for fossil fuels used for power generation. For there to be minimal backlash, there must also be adequate awareness on the effectiveness of renewable energy. Besides that, it is important that people come on board with the idea of renewable power generation, which would motivate other people to jump on the bandwagon. A good example is renewable off grids which power remote communities. Similar off grids in the rural areas of Indonesia, Myanmar and the Philippines are good cases to show how renewable energy is not only good for the environment but also a practical solution for power generation for the unelectrified. Ultimately, going the way of renewable energy is no easy task. It is a long, arduous and challenging project. However, if pulled off well, it will bring long-term benefit for all and it’s the destination that all ASEAN member states should be aiming for.